NHCC roundtable and event at Lipscomb University on September 27, 2018. Photo by Donn Jones. On Thursday, Sept. 27, Health and Human Services Secretary Alex M. Azar II addressed members of the Nashville Health Care Council, sharing thoughts and updates on healthcare coverage in America at an event held at Lipscomb University. After an introduction by Gov. Bill Haslam, Secretary Azar took to the podium and shared his pleasure with addressing Health Care Council members on their "home turf" after running into them across the globe throughout his two decades in HHS leadership. "There's a reason that Nashville healthcare leaders have kept popping up throughout my career," he said. "It's because Nashville has become a thriving hub for healthcare innovation." Pointing to the diverse ecosystem, he added, "So much of what is great about American healthcare is in evidence here in Nashville - the zeal for innovation, the respect for patient choice and the harnessing of market forces to improve care." Calling the Affordable Care Act a failed example of wielding government regulation and intervention in an attempt to improve healthcare, Azar said the law instead fostered skyrocketing costs and disappearing choice. "But today, I am here to share with you some good news," he continued. He said premiums have begun to stabilize, and consumers are seeing growing choices, including more options for short-term, limited-duration insurance and expanded access to association health plans. He added that President Trump moved quickly to give states more flexibility in delivering healthcare to their citizens. Touting the president's business acumen and willingness to work with the private sector, Azar said there is "clear evidence" that such an approach works "even within a failed system like ACA." Noting that many in the audience had probably already heard premium projections for the federal exchange have stabilized, he said there is actually even better news. "We are announcing today that, for the very first time under the Affordable Care Act, the premium for a benchmark federal exchange plan is projected to drop," Azar stated. "Insurers have proposed to cut premiums for these benchmark plans by 2 percent nationally. Meanwhile, the number of federal exchange insurers will grow for the first time since 2015." He added, "Here in Tennessee, the proposed benchmark rate will drop by 26 percent ... more than a quarter." He noted the president has approved a number of state reinsurance plans, citing Maryland as a successful example where rates had been projected to rise significantly. "But in large part thanks to our approval of the reinsurance program last week, Maryland's insurance commissioner announced the rates will now drop by 13 percent," Azar said. "Despite these positive signs, we still face major challenges. Fundamentally, the individual market for insurance is still broken," he stated, adding he believes the ACA isn't "fixed" or even "fixable" but should instead be repealed and replaced. Azar noted that those who don't learn from history are doomed to repeat it and said the notion of "Medicare for All" would repeat "failed ideas on all of American healthcare." He added, "The main thrust of Medicare for All is giving you a new government plan and taking away your other choices." Azar also said he was concerned about the financial undermining of the current system for seniors. "The core financing of any Medicare for All plan is putting everyone on a plan that pays providers these lower Medicare rates." Azar opined that the lower reimbursement would either drive physicians from the field or into a position where they only accept cash. "A large private insurance market that rewards the best doctors is vital to sustaining the access that seniors have under Medicare today," he stated. "It's simple math: Higher payments from commercial insurers help doctors take on seniors whose Medicare plans pay less. It's far from an ideal system, but a single government system would completely unravel it, without a theory for how seniors' access would be protected." He also said moving to a single government healthcare delivery system would come with enormous hard costs to set up and implement. "It is reckless to propose more than tripling the size of Medicare with no clear way to pay for it when we haven't even agreed on responsible ways to maintain the current program for our seniors," he said. 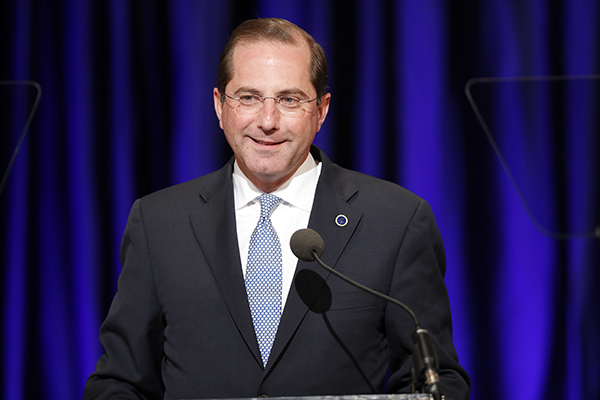 Saying that Americans want choice, Azar advocated for "sending power back to the American people - to states, to local communities, to your doctors, and to you, as American patients. Empowering the decision-makers closest to patients is both the way of the future and a return to what we love about American healthcare."